After some mild deliberation I decided to try sourdough again, the last starter eventually gave up and died. Well, I think it did? When things go grey and smell bad they are usually dead, my time working in a mortuary taught me that, and to be honest, I was glad. Of the 8 or so loaves I attempted only one came out well. The others were under baked, or over proved. I tried overnight on the kitchen side, in the fridge for longer, more kneading, less kneading and I couldn’t win. This time I intend to try something new, I am going to try research and love. The last starter was resented and banished to the back of the fridge with the half eaten Christmas chutney and withered spring onions, neighbouring the weird stain I couldn’t scrub off the fridge wall from previous tenants. I would only bring it out to feed it for another round of “don’t cry, it’s only bread” on a Friday night and no belief that it would work. So this time I intended to care for it as I would a pet or tiny human, love it, cherish it and remember to feed it. I started to ask the bakers of the internet their best tips and found a recipe online that looked easy to follow. So I began my starter…poured it away and did another one because I remembered you shouldn’t mix with a metal spoon, It damages the yeast or something. See RESEARCH. The starter needs feeding again, it’s looking bubbly and smelling a bit sweet so it’s on its way to being what it should be being. This is good, my chest swells with pride and confidence, I can add water to flour and it hasn’t exploded yet. I have had some feedback from a few bakers and it’s all contradicting and confusing. Some of them want me to buy their books and some of them admit they take their starters on holiday. My chest deflates (thank goodness, the spice shelf was being wiped out every time I turned left) and frustration creeps in. No wonder I can’t make the damn stuff work if these professionals can’t agree either. I shut Twitter down, kiss the starter goodnight and head to bed. I ran out of bread flour and so used plain flour, the research thing and “doing it properly” has fallen by the wayside because i can’t be bothered to put my shoes on and go to the shop. The mixture doesn’t look like its doing much and I hope for the best. Mixture still didn’t look very exciting. It smelled a bit funky as it should, few bubbles. I was given advice on twitter about adding rye flour or wholemeal flour which I promptly ignored and carried on feeding it with plain flour (I kept forgetting to buy bread flour). I also had to transfer it to a bigger jar after not paying much attention to the amount of flour I putting in, so far this “treat your starter with love” thing isn’t going too well. My phone buzzed whilst I was out and I had been tagged in an Instagram picture. My housemate had come home to STARTERGEDDON and the damn thing had turned into “The Blob” and tried to take over the house. The weather had been horribly warm and sticky and it seems to have started a chemical reaction I had not prepared for. I got in the door and the jar had been placed in a bowl where the starter had continued to overflow and had formed quite the bond. 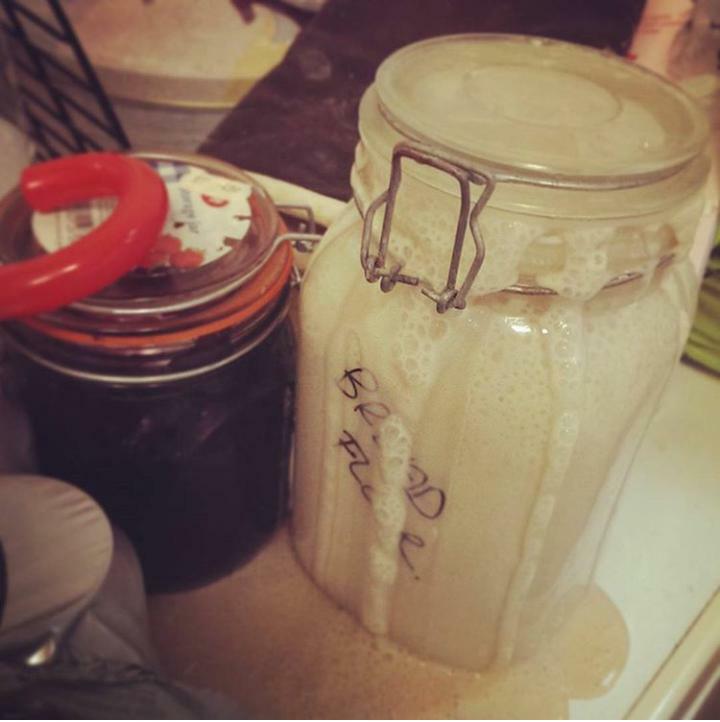 I poured the starter back into the jar, gave it a stir and placed the damn thing in the fridge in the hope it might get it to calm the hell down. There is sourdough all over my vegetable crisper. I’ve put it in the sink and gone to work. Have had more advice for another expert on Twitter and have been told I need to tip most of it away and go with what I have, it’s obviously now a starter as it has become sentient and has tried to assimilate the peppers it shared the crisper with. I’ve called the government to warn about the impending take over but I was told to stop bothering them. I consider signing up with Periscope to keep an eye on it at work and then realise not even I can be bothered to sign up with and use Periscope. I leave the house and fear for my belongings. Time for some real talk boys and girls, some of us are not cut out for sourdough ownership. Yes they will tell you it’s easy, they will tell you to do this, that and the other but really go support your local independent bakery and just buy one. I cannot begin to tell you how disappointing and life damaging it is to be thwarted by wet flour. Really. From now on I only bake bread made from yeast I have bought in a sachet and no I don’t want your “hot take” on that. Haha thanks for reading Sammie, sourdough really is too much faff for someone that can’t even keep a house plant alive! I’d rather pay someone else to cry over it!